It is a dihydropyridine calcium-channel blocker that blocks the transmembrane inﬂux of calcium ions into vascular smooth muscle and cardiac muscle. It relaxes (widens) blood vessels and improve blood flow. 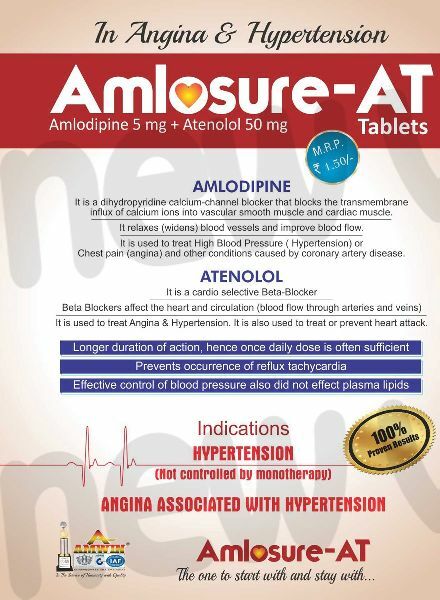 It is used to treat High Blood Pressure ( Hypertension} or Chest pain (angina) and other conditions caused by coronary artery disease. It is a cardio selective Beta-Blocker. Beta Blockers affect the heart and circulation (blood flow through arteries and veins). It is used to treat Angina & Hypertension. It is also used to treat or prevent heart attack. Longer duration of action, hence once daily dose is often sufficient. Prevents occurrence of reflux tachycardia. Effective control of blood pressure also did not effect plasma lipids.